Once that's done, you can verify your email address and join a Dropbox Business team. Every Dropbox account is linked to an email address, which allows you to verify your identity and receive notifications about your account. Check your email for the invite to join your organization's Dropbox Business team. Click Join your team in the email. If necessary, sign in with your username and password to your existing Dropbox account. 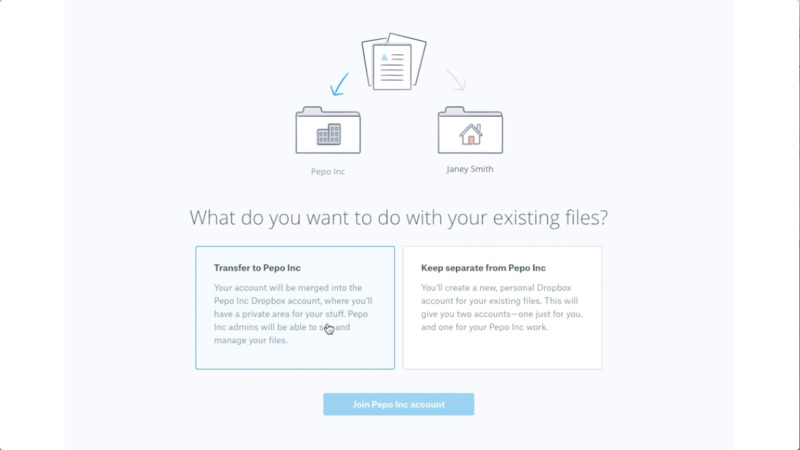 Decide where you want to move the files and folders inside your current Dropbox. 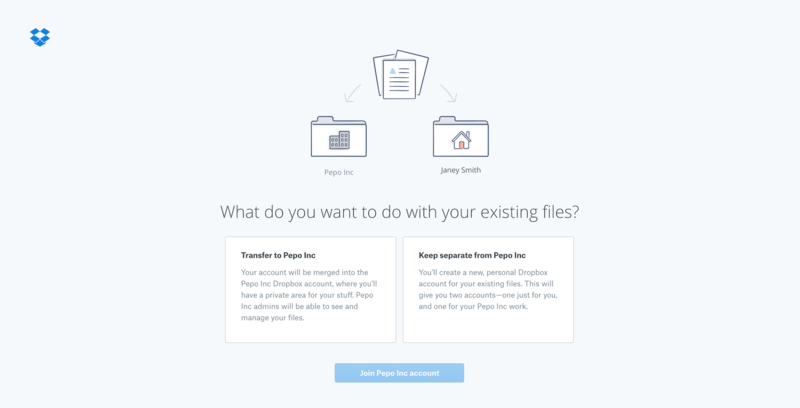 If your files are mostly work related, select Join [Dropbox Business team]. If your files are mostly personal, follow the instructions below. All of the files currently in your Dropbox will transfer to your Dropbox Business account, and you'll be able to access them by downloading the Dropbox desktop app or by visiting dropbox.com. Enter a different email address and password for your new personal Dropbox account. If necessary, verify the email address (check the inbox of the email you provided and click the button in the email). All of the files currently in your Dropbox account will transfer to your personal Dropbox account, and you'll be able to access them by downloading the Dropbox desktop app or by visiting dropbox.com. If your company has enabled single sign-on (SSO), you'll follow a similar path. However, you'll also be asked to sign in to your SSO provider, which uses your work email address and password. If you have any issues signing in on a page that is not dropbox.com, check with the admin of your Dropbox Business team. What happens to my Plus or Professional subscription when I upgrade to Dropbox Business? If you upgrade or transfer from Dropbox Plus or Professional to Dropbox Business, your Plus or Professional subscription will immediately end. Any remaining credit on the Plus or Professional subscription will be refunded to the original payment method. Each individual Dropbox account owner can track this information on the account payments page. If the automatic refund does not go through for any reason (such as an expired credit card), we'll notify the account owner by email.